Our Penang trip continues to Toh Soon Cafe (多春茶座) in Georgetown, after hanging out at Sun Yat-sen Museum. 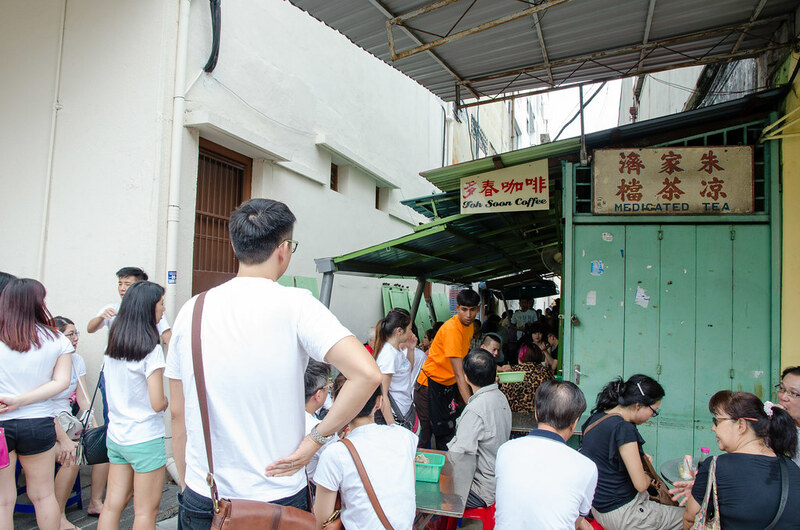 Toh Soon Cafe is a Chinese coffee shop which serve one of the best Hainan coffee in Penang according to locals and bloggers. They also serve very delicious Malaysian style breakfast, the soft boiled egg with charcoal-toasted bread. Soft boiled egg in a cup with soft and fluffy kaya charcoal-toasted bread at Toh Soon Cafe. 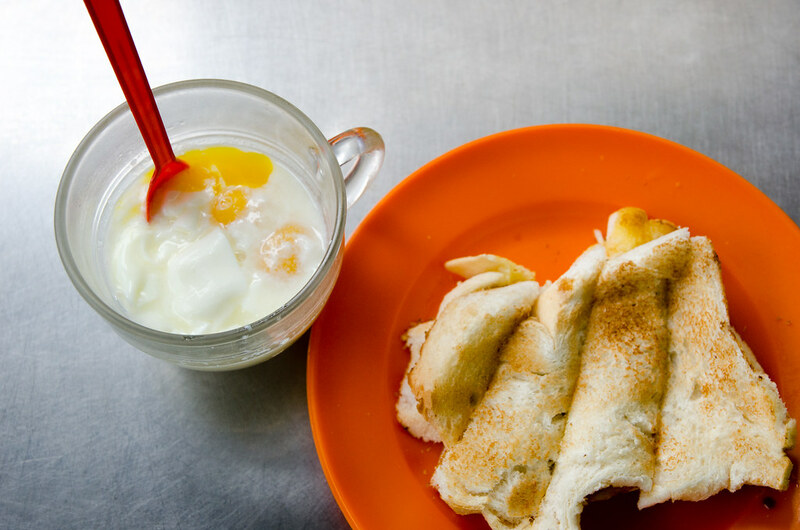 If you love this Malaysian local breakfast, this one is a must try. Another coffee shop, Kedai Kopi Kong Thai Lai (广泰来茶室) nearby also serve amazing soft boiled egg and toast. Personally I prefer Toh Soon Cafe’s toast as it is softer. 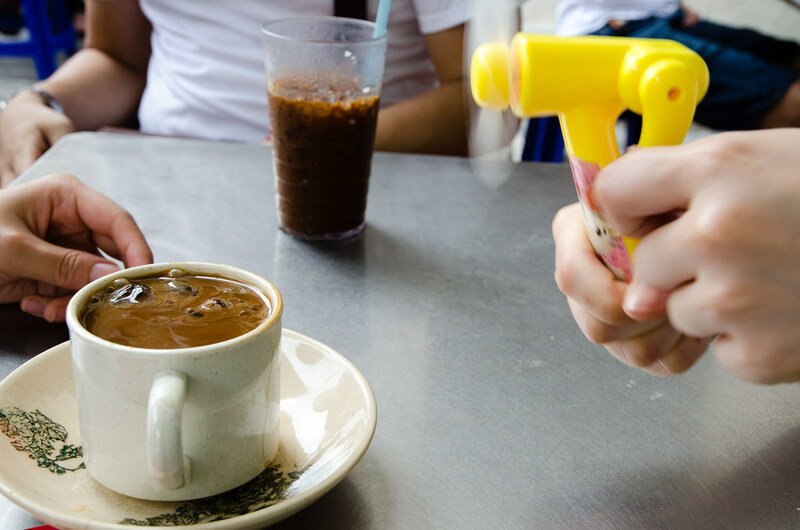 A cup of authentic local Hainan coffee. I cannot describe the taste as it is not mine. But from my colleague’s face, I can tell it is an awesome delicious cup of coffee. 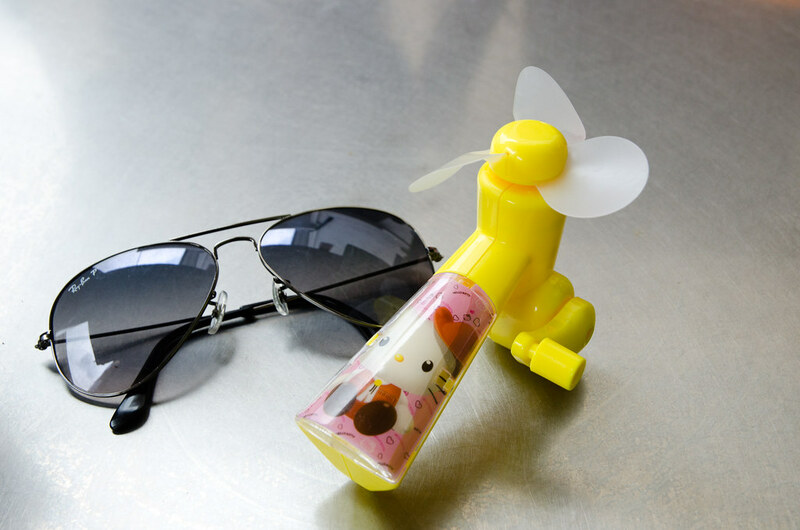 Feeling hot walking around Penang’s streets, colleague bought this Hello Kitty’s manual fan, which you saw in the coffee photo before this. Why manual? Because you have to use your hand to turn the fan manually instead of using batteries. 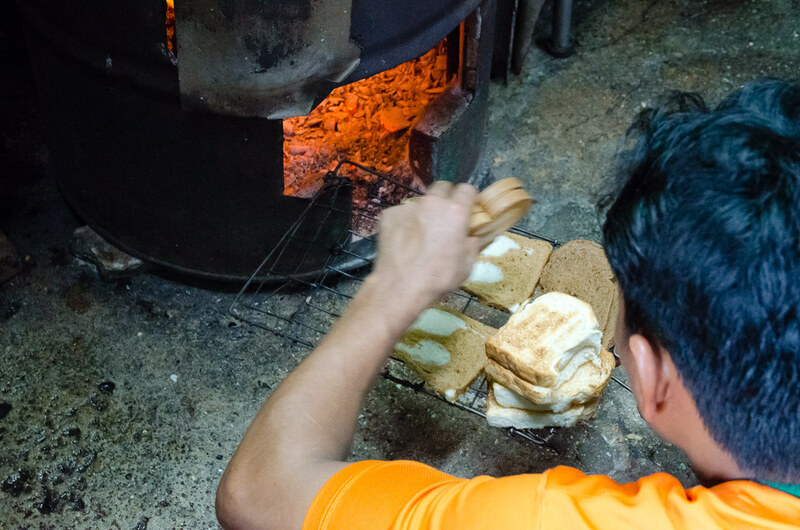 The bread at Toh Soon cafe is toasted the traditional way using charcoal. The charcoal stove looks very old and it looks like a big drum. Must be a lot of work toasting and turning the bread on charcoal. This explains why we have to wait for a while for our bread to arrive. The menu of Toh Soon Cafe. You can choose from 4 types of breads, Hainan, Coffee Marbel, Wholemeal and Chocolate bread. Both the kaya and peanut butter are home made but the butter is imported. As for the egg you can choose the egg on toast or served in a cup. Please note Toh Soon Cafe is closed on Sunday. During our previous Penang trip, we do not know about this and came on our last day in Penang which is a Sunday. Toh Soon Cafe is usually very crowded with locals and tourists. Grab an empty seat as soon as you saw one. Besides the bread and eggs, you can also eat nasi lemak here according to bloggers but I do not see any on the day we were here. 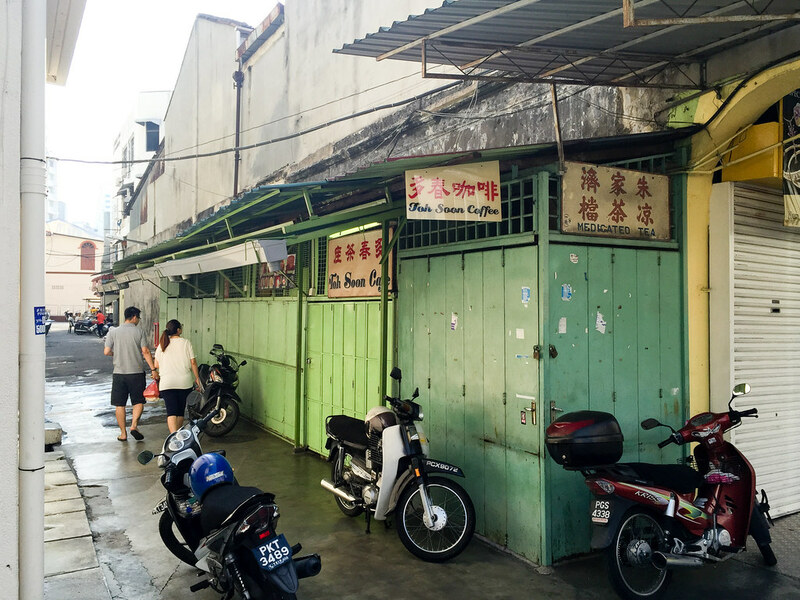 Toh Soon Cafe is located in this alley along Campbell Street in this tourists area of Penang. And remember, it is closed on every Sunday. Be prepared to spend some time here as it is usually crowded.